Raymond W. (Ray) Cross, Ph.D., began his appointment as the seventh president of the University of Wisconsin System on February 15, 2014. The UW System’s two doctoral universities, 11 comprehensive universities, 13 freshman-sophomore campuses, and statewide extension annually serve more than 170,000 students, and reach more than one million Wisconsin citizens through outreach, public broadcasting, and continuing education programs. Cross leads a UW System workforce of approximately 39,000 faculty, academic and university staff, and graduate assistants. He is also responsible for the UW System’s $6 billion annual budget, made up of state support, federal funding, tuition and fees, and private gifts. He reports to the UW System Board of Regents. 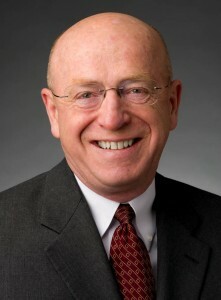 Previously, Cross served as chancellor of the University of Wisconsin Colleges and University of Wisconsin-Extension from February 2011 through February 2014. From 1998 until coming to Wisconsin in 2011, Cross was president of Morrisville State College, a residential agriculture and technology college of the State University of New York (SUNY). He led that school in developing and implementing a new college vision and strategic plan, which strengthened the institution’s academic quality, promoted the development of several new academic programs, integrated technology into all programs, encouraged entrepreneurialism and innovation, and established applied business centers throughout the college. Cross also spearheaded several agriculture, energy and technology initiatives, including the ThinkPad University partnership with IBM and a biodiesel co-generation project, and made rural entrepreneurship a priority. Cross served as president of Northwest Technical College in Bemidji, Minn., from 1992-98. Previous to that he was a department head and a professor (1977-92) at Ferris State University in Big Rapids, Mich.
Cross received his doctorate in college and university administration from Michigan State University. He earned a master’s degree in industrial education at Central Michigan University and a bachelor’s degree in technical education from Ferris State University. In 2007, Colgate University awarded Cross an honorary doctorate of science. In addition to his career in academia, Cross has experience in the private sector as a design engineer, small-business owner and consultant to business, industry and government. From 1967-70, Cross served with the U.S. Army in Vietnam and was awarded four medals for his service.